Custom Citation (Ticket Book) "San Francisco Police Dept." 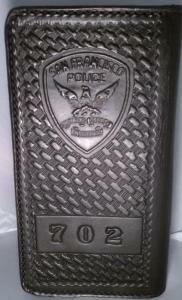 Custom order "San Francisco Police Dept." Citation (ticket) book. The front of the ticket book will read your badge number, up to four letters, or numbers (can be combined). The book features the "Oro en Paz, Fierro en Guerra" SFPD police patch and is made from 6 to 8 oz of heavy duty holster leather. The inside of the book has a driver's license holder clip and a pen holder. The back page can read your last name, up to 10 letters. If the display of the last name is not desired, all basketweave is available. TKBK-SF Ticket Book, San Francisco Police Dept. During check out please list what you want your ticket book to read. and your phone number in case there's any questions.